I have a fig tree, and this fig tree has my heart. What this fig tree does not have, unfortunately, is a reliable second crop of figs in our cool-summer climate. So, after the breba crop ripens, that’s usually it. This year, I dried all the breba figs I could, to try to extend our enjoyment of this perishable delicacy. Some of the dried figs were further preserved as a fig bourbon infusion. 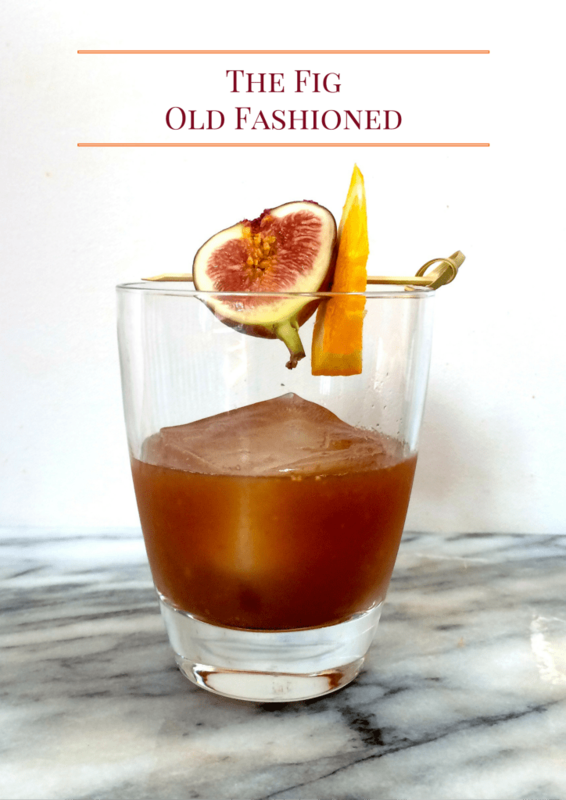 Fig bourbon, it turns out, makes a damned fine Old Fashioned. 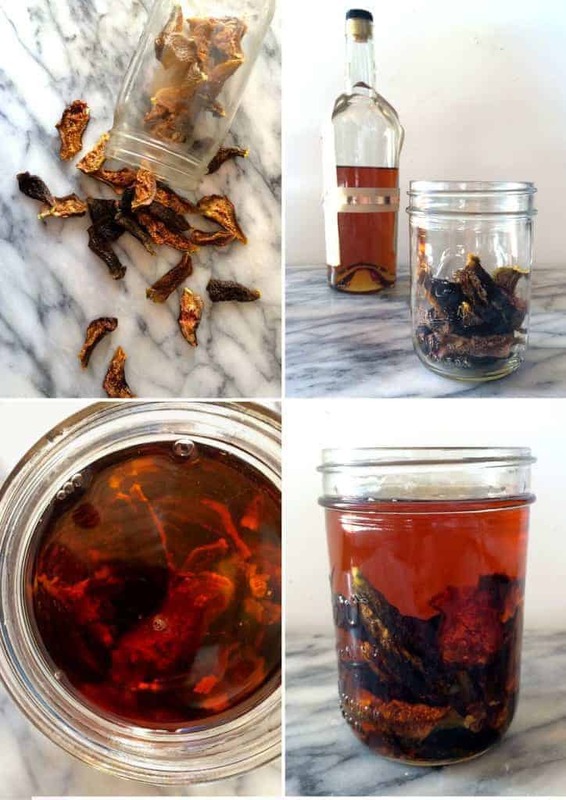 To make the fig bourbon, fill a mason jar half-full with dried figs. For a 1-pint mason jar, you’ll need about a cup of dried figs. Fill the jar with a decent-quality bourbon (ignore the Basil Hayden “stunt” bottle in this photo – we typically use Jim Beam for infusing), lid tightly and let the bourbon sit at room temperature for at least 48 hours, and up to a week or longer. 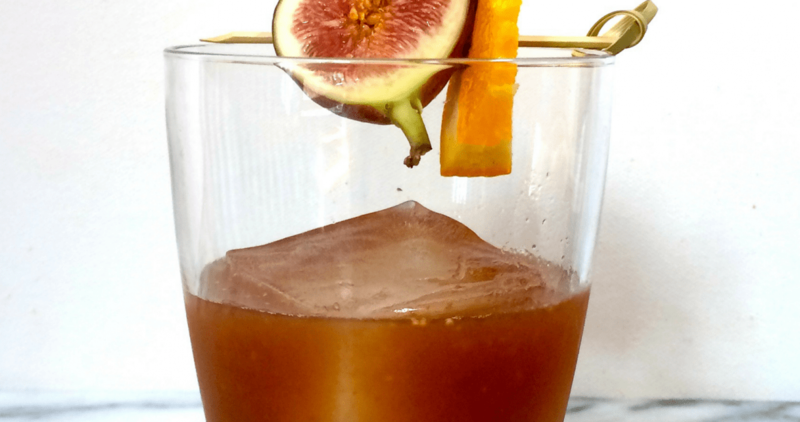 When your fig bourbon is ready, sip it neat, or mix it up as a Fig Old Fashioned. You’ll need fig-infused bourbon, fresh orange, either a fresh fig or one of the dried figs from the infusion, and a good quality balsamic vinegar. I’ll be honest here. From a flavor standpoint, both the fresh and the dried fig variation are delicious. However, the bourbon soaked dried figs do look a bit slug-like, so for aesthetics the fresh fig wins out. In this Old Fashioned variation, we start by muddling a wedge of fresh orange and one-half fresh or one dried, bourbon-soaked fig at the bottom of a bar glass or mason jar. If you are using a fresh fig a few seconds of muddling will convince the fig to disintegrate into a sweet mass at the bottom of the jar. If you are using a dried fig you must be stern, and prepared for a long bout of serious what-for with your fig. Once your fig – fresh or dried – and your orange wedge is a pasty mass at the bottom of the glass, add in one barspoon-measure of good quality balsamic vinegar and a heafty glug of the fig infused bourbon. Add a handful of fresh ice to your glass and stir everything together. At this point a traditional Old Fashioned would be simply dumped into an appropriate glass, garnished and served. But for a slightly less messy look, just strain the contents of your bar glass into a rocks glass over ice, and garnish with a fresh fig and an orange wedge. 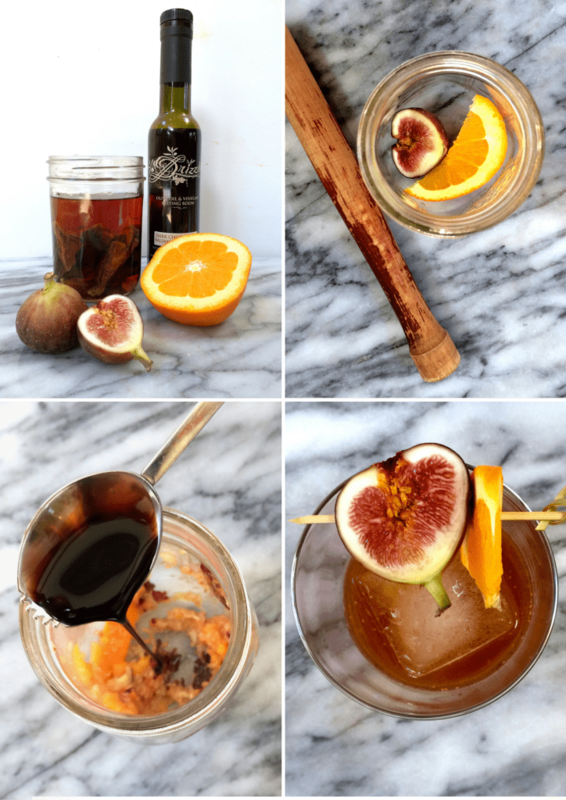 Add the fresh fig and the orange wedge to the bottom of a sturdy bar glass or mason jar. Muddle until the fig and orange are thoroughly broken up. Add the balsamic vinegar and the fig infused bourbon to the bar glass. Fill the bar glass with ice and stir the cocktail well, for 10 to 20 seconds. Strain the drink into a chilled rocks glass. Add ice, garnish with half a fresh fig and a small wedge of orange, and serve immediately. I’ve been eagerly anticipating this since Book Larder. Hooray! (Gorgeous pictures, too.) Thank you! What are you on about putting vinegar in an Old Fashioned? A replacement for bitters? I too was suspicious and aghast at the idea, but when we tested it, the result was fantastic! Make one! They are tasty! My tree is outside year round, in a sheltered location. It’s maybe 8 years old now, and I’ve been getting good harvests for the 4 or 5 years, so I’d say expect yields starting at about the 3 to 4 year mark. But it can vary a lot based on location, fig variety, etc.